Limiting the global temperature rise to well below 2°C this century is one of the defining challenges of our age. Two thirds of greenhouse gas emissions come from energy-related sources. This makes the transition to sustainable energy the decisive factor in tackling climate change. Renewable energy, together with energy efficiency, form the cornerstone of the world’s mitigation strategy. They represent a safe, reliable, affordable and immediately deployable pathway to a low-carbon future that can achieve over 90 per cent of the energy-related CO2 emission reductions needed to meet climate goals. Avoiding the worst effects of global warming will require us to source at least 85 per cent of global power from renewables, with a minimum of two thirds of total energy from renewable sources – wind, solar, geothermal, hydro, bioenergy and the burgeoning tidal technology – by 2050. This means that we must utilise the solutions available to stimulate systemic transformation towards a digitalised, decentralised and decarbonised energy paradigm. In addition to mitigating climate change, such an energy transition could also deliver long-term economic and social benefits. IRENA’s Global Energy Transformation: A Roadmap to 2050 shows that it would boost global GDP by one per cent by 2050 and create millions of new jobs. Last year alone, the renewable energy sector created half a million new jobs, reaching a total of 10.3 million. The business case for renewables has never been stronger. It is encouraging that this transformation is already underway. Most notably, there is momentum within the electricity sector. Today, renewable energy meets a quarter of global electricity demand. In 2017 the world installed 167 gigawatts (GW) of renewable energy capacity – more than the total installed electricity capacity of Brazil – and a record in new capacity terms. Against a backdrop of falling costs across the technology spectrum, renewables are fast becoming the most cost-effective source of new power generation in much of the world. IRENA’s 2017 Renewable Power Generation Costs analysis estimates that by 2020 renewables will be cost competitive with fossil fuels in most parts of the world, and in many cases will be much cheaper. Low-cost renewables have been a key factor in recent developments. The UK, for example, has reduced its reliance on coal for power from 40 per cent in 2012 to 6.3 per cent in the period October 2017 to September 2018, as a result of its rapid renewable energy adoption. 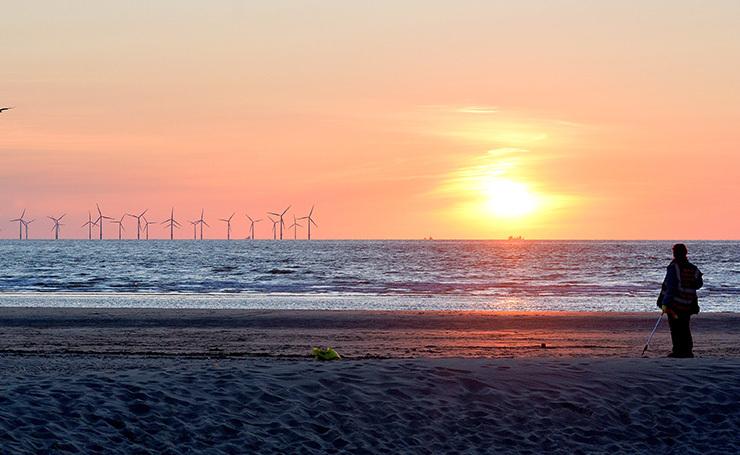 Half of Europe’s offshore wind-capacity growth in 2017 was in the UK. Furthermore, in June, the European Union increased its renewable energy targets to 32 per cent from 27 per cent by 2030, demonstrating that a cost-effective pathway to a higher share of renewables exists. 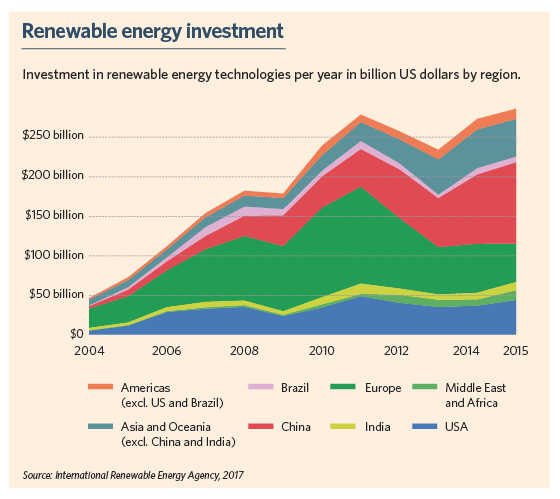 Indeed, renewables are a global trend. In 2017, China added a world record of 53 GW of solar photovoltaic capacity. Meanwhile, Morocco is turning the desert into a resource and aims to generate 510 megawatts of concentrated solar power from its new plant in Ouarzazate. Even oil and gas-exporting countries worldwide are now investing in renewables. The energy strategy of the United Arab Emirates, where IRENA is based, seeks to cut carbon dioxide emissions by 70 per cent by 2050, and to generate 44 per cent of its power from renewables. Last year, the Russian Federation conducted its largest-ever renewable energy auction, awarding contracts for 2.2 GW. Outside of the power sector, however, progress is lagging. End-use energy sectors, such as heating and cooling in buildings, and transportation, are a major source of energy-related emissions. Yet the share of renewables in these sectors remains low, with little progress in recent years. Instead, they still rely predominately on fossil fuels. Replacing these polluting fuels with electricity, while also ensuring that this electricity is increasingly generated from renewables, is the key to reducing the carbon emissions of these end-use sectors. Transport is a good example of such an opportunity. Electrified mobility is on the rise. In 2017, 1.2 million new electric vehicles (EVs) were sold globally, equal to around 1.5 per cent of all vehicle sales. In the last five years, EV sales have grown at an annual rate of 52 per cent. By 2050, up to one billion electric cars could be on the road. In parallel, renewable power can provide energy for hydrogen production – an emission-free fuel, which can complement electricity and biofuels in the energy mix of the transport sector. While significant investments are required, this combination could lead to a 70 per cent fall in oil consumption for transportation, significantly reducing emissions. The deployment of renewable technologies can stimulate new economic activity, creating jobs, mitigating stranded assets and giving rise to cleaner, healthier environments. The benefits deriving from energy transformation significantly outweigh its costs. In economic terms, the cost savings resulting from improved human health, lower air pollution and avoided environmental damage by 2050 equal up to five times the additional investment needed to make the transition. If we were to meet our targets by 2050 nearly 40 million people would be directly employed in renewable energy and energy efficiency. And the global economy would enjoy a $52 trillion cumulative GDP gain.